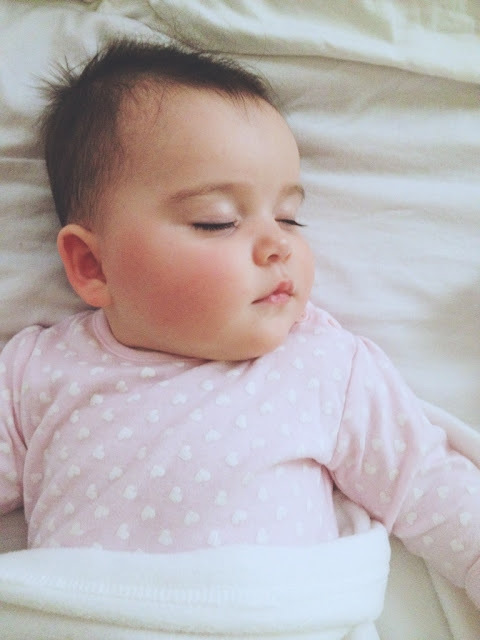 Cinq :: A sweetly sleeping baby from earlier in the week. This was quite the rare sight this week. After Monday (when this picture was taken), Avienne kindly resisted her usual daytime naps in lieu of playing with the stuffies in her crib and talking to herself. She did not, however, hesitate to catch a bit of shut-eye while in her carseat in between running errands, which left me sitting in the driveway or parking lot a few times (instead of eating lunch) while she slept. Let me tell you, eating a cold lunch is so much more appetizing when there's a well-rested baby wandering about. She is so beautiful ! I don't comment each time but I come to read as often as I can your blog... To be honest, I have some difficulties with the code we have to type for commenting :) Sometimes, I can't read the numbers. For once, I have the feeling I will succeed to post a comment, so I dare to ask you one question : do you still live in USA or are you back in france ? Hi Axelle! Thanks for commenting - it's nice to hear from readers I dont even know I have! :) Those captcha letters always get e, too! Thank you for your answer, and I just read your "portrait" ! When I was 18 (I'm 40), I went to live in Italy so I understand what you're explaining about your feelings being an expat. I'll keep on reading you. Have a great day and thank you for sharing your daily life !